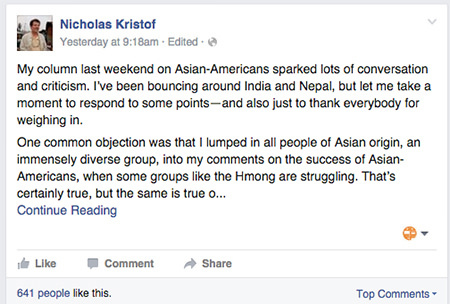 Nick Kristof’s column reframing Asian Americans as the “model minority” caused quite a stir last week. And the New York Times op-ed star’s response published on Facebook probably won’t win over his many critics. I wasn’t sold. (See my original column in response to his here). Let me just say, his offending column does arrive at the same conclusion most sane Asian Americans and anyone else living in these modern times would reach. Post-racial times? In this era of inequality–who are you kidding? Discrimination is not over. That’s where Kristof and I can comfortably agree. He just takes a strange approach to get there, using his notion of Asian American success by lumping us all together like some human version of Gold Mountain. 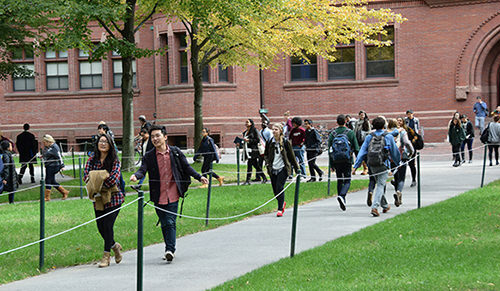 At Harvard Yard, Asian Americans now make up 21.3 percent of Harvard’s freshman class of 2019. Even with that, Kristof still boldly included his assertions in the column. But that still didn’t stop him. Sure, but why rely on an overgeneralization that you know is a racist myth to begin with–one easily disproven by the lack of economic and educational success of Hmong Americans, Laotian Americans, and Cambodian Americans? If you know some groups are struggling, insisting on an “Asian Advantage” is as racist as saying all blacks are great athletes. That got Jimmy the Greek fired from CBS in 1988. Blacks? Kristof says his column was about black disadvantage. Did you get that on your first read? When 90 percent of his column is about Asian Americans and success, you can see how I might have missed that. Only at the end of his column does Kristof mention how the “Asian Advantage” could benefit someone like the “black boy in Baltimore who is raised by a struggling single mom, whom society regards as a potential menace.” By then, it’s just a strikingly offensive line on top of a tired iconic stereotype. Kristof apparently feels justified perpetuating the model minority stereotype under an “Asian Advantage” label because it exposes whites who use Asians to discriminate against blacks. So he does know better. But what the heck. He still wrote the column. So perpetuate a racist myth against Asian Americans because it’s already widespread? But that’s OK because he uses it for good to fight the myths some whites still have against blacks? And the KKK should have more bake sales too? This isn’t about political correctness. I’m not about being a PC cop. This is simply about being direct in challenging racism against blacks without resurrecting the model minority myth about Asian Americans. A straight mea culpa would have been better. We can all agree on one thing: Discrimination against people of color isn’t over. But that will be difficult to overcome if our conversations about race are as confused as Nick Kristof’s “Asian Advantage” column.